SOLD $235,000 Affordable Port Orange Pool Home! Style: Single Story "Great Ranch Home!" Bedrooms: 3 "All Roomy with Good Closets!" Size: 1,301 sq. 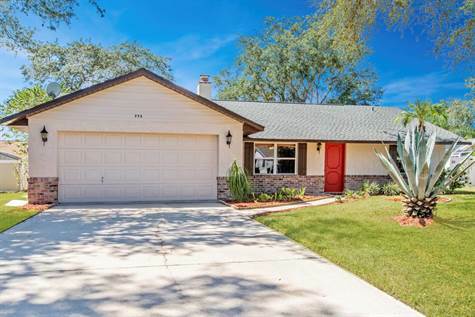 ft. "under air/1784 total"
This 3 Bedroom 2 Bath pool home is located in a central Port Orange neighborhood and zoned for great schools! Inside you have an open Kitchen with Dining Area where family & guests can gather; Living Room with beautiful, custom-built, woodburning fireplace; Split bedroom plan; updated neutral paint throughout interior gathering areas; and, outside is your screened-in, private, Sparkling Pool to cool off in and the fenced yard beyond; large Covered Lanai to provide extra entertaining space; landscaping; & all New Exterior Paint. Located near Neighbors Country Store, All Children's Park, Spruce Creek High School & Elementary, and close to plenty of other shopping; restaurants; hospitals; major roads; and the World's Most Famous Beach. And just an hour's drive to Orlando theme parks! NO HOA in this neighborhood. All measurements are approximate and home is selling as is with inspections gladly welcomed!